It is becoming very trendy to put your alcoholic beverages in a fruit at bbqs and parties. Hollowing out pineapples or watermelons adds a hint of flavor to your specialty drink, while also looking fun and festive. When you use a small piece of fruit, such as a coconut or pineapple, you can easily stick a straw in the drink and go to town. However, that isn’t the case with large pieces of fruit, like watermelon or pumpkins. Unfortunately, getting the drink out can be challenging. However, that all changes with the watermelon keg tapping kit. 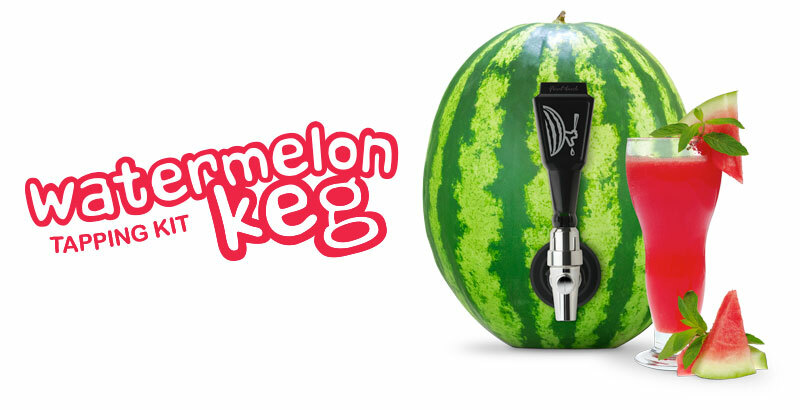 The watermelon keg tapping kit comes with a coring device and a spigot. You can use the coring device to cut the hole in the fruit in which you will insert the spigot. Once the spigot is in place, you once again using the coring device to cut the hole in which you will pour the alcoholic beverage in. Once the alcohol is in, you can place a cup under the spigot, turn it, and have a beverage dispensed from the watermelon.